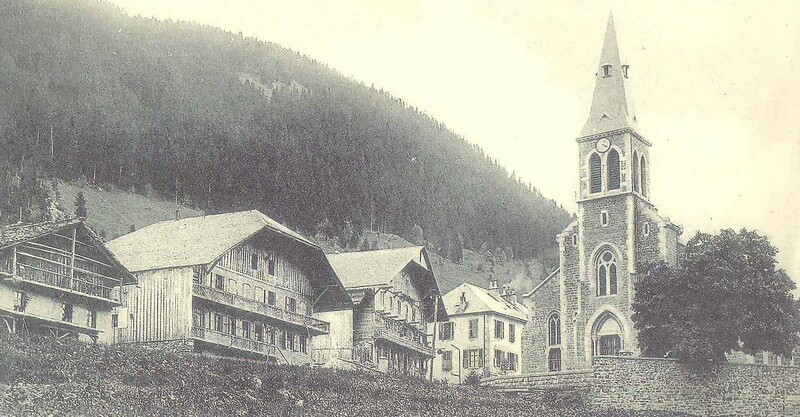 Having tried and failed in its initial efforts to promote itself as a thermal spa resort, Châtel took its first steps to becoming a summer tourist destination and welcomed holidaymakers and convalescents looking for tranquillity in beautiful surroundings. Farming remained the principal occupation of Châtel. The first skiers came to the region and tried out the slopes without any mechanical lift system and it wasn’t long before the idea to build a drag lift was born. Christmas 1948 saw the arrival of Roland Macchi, father of future French champion Francoise, from the Jura. He set up the first ski school in Châtel which he ran for the next ten years, putting Châtel firmly on the winter tourist map. In the 1950s the slopes of the Morclan were developed from the bottom of the village to the summit with the construction of a chair lift and drag lift, a hotel half way up the slope and another in the village – Super Châtel was born! At this time, the fact that people crossed the French/Swiss boarder on skis was a result of the close links that had always existed between the people of Châtel and Morgins. The concept of the Portes du Soleil was born in Super Châtel and as a result Le Grand Hotel in Morgins was revived. Shops, nurseries, hotels and sports shops all sprung up around Super-Châtel. Clients, predominantly from Paris, began to visit the resort. The Portes du Soleil now had an assured and promising future, but it needed to expand. In 1967 the Linga area was developed and a gondola lift installed. In 1968 the second section was built giving access to the summit and a 1,000m vertical drop with an off-piste area at Les Combes! A few years later, a lift was built here too. Portes du Soleil, a major ski destination. The summer season underwent considerable development too with the introduction of new infrastructure and facilities and the organisation of large summer events. The 1970s saw a property boom, but the resort was careful to retain the traditional village style loved by visitors. The clientele diversified and now started to come from abroad: the North, East and Southern Europe. Many Châtellans (inhabitants of Châtel) continue to work in agriculture today (about 30 families in all), farming several hundred Abondance cattle, (which celebrate their 120th birthday in 2010), producing the famous Abondance cheese (AOC since 1990). 2014 - Portes du Soleil and Gabelou detachable chair lifts : connection between Super-Châtel and Linga.